TTQ is the work program of Gen-Q (Generation of Qur’an). 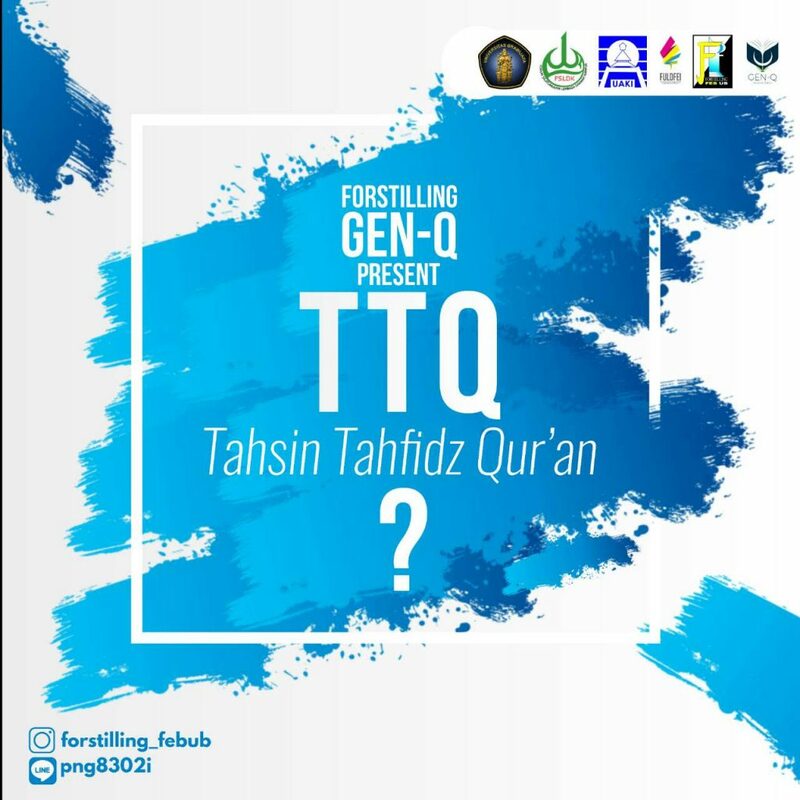 Gen-Q itself has a purpose as a forum for students and residents of the Faculty of Economics and Business Universitas Brawijaya to learn to read and memorize Al-Qur’an. The Qur’an is the Revelation of Allah that is revealed to the Prophet Muhammad SAW and his people and is the main reading for Muslims throughout the universe. This Qur’an as a guide for the ummah of Islam in worshiping to Him. And the Qur’an also has multi-function and always has a definite relationship in the phenomena of life, these include miracles, aqidah, worship, mu’amalah, morality, law, history, and the fundamentals of science. That is why the Qur’an is very important to learn, because it is very unfortunate if Muslims away from the Qur’an. Therefore, the construction of the Qur’an from early will lead a Muslim into a civilized, ethical and religious personality in the attitude. Therefore, we formed a community of qur’an lovers to restore the love of FEB UB student students to Al Quran and also as a facility for FEB UB residents who want to learn to read qur’an well and correctly. So one program of Gen-Q TTQ was formed. This year, TTQ has the theme of “Al-Qur’an Solution to Deliver Generation”. This program is in the form of two kinds of activities, namely upgrading mentor (study) and halaqah learning Al-Quran, which consists of two classes: tahsin (class to improve reading of Al-quran) and tahfidz (keas to memorize Al-quran). Where the study activities are filled by experts who are experts in the field of religious knowledge, especially Al-Qu’an, while halaqah Al-Qur’an is filled by the mentors of students who have expertise, both in the field of tahsin and tahfidz. The main purpose of this program is to foster a sense of love of students against the Qur’an, because it is said in a hadith that the best man is who learns Al-Quran and practice it. In addition, it is expected that with this program students also improve the quality of reading and can be a memorization of Al-Quran and increase the insight of students or female students of the Faculty of Economics and Business Universitas Brawijaya.